As an homage to the Stonehaven Fireballs ceremony we gave it a shot after our Hogmanay dinner and took Hyde Square by storm. 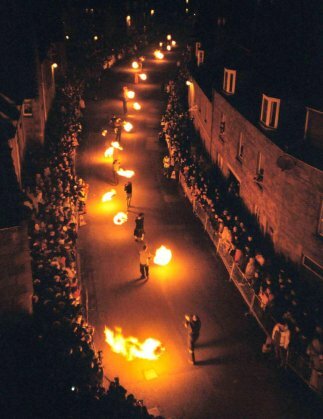 What is commonly called “The Fireballs” is a colorful annual festival, unique to Stonehaven and attracting thousands of spectators in festive mood. The ceremony is not only Stonehaven’s way of welcoming the New Year, but it also provides a gathering point for the town’s “ain folk”, some home from distant lands, to greet relatives and old friends, mingling happily with visitors from home and overseas who have come to enjoy a guid Scots Hogmanay.